This new jewel of a pack is a great all rounder, from heavy to light and ethereal and all shades in between. 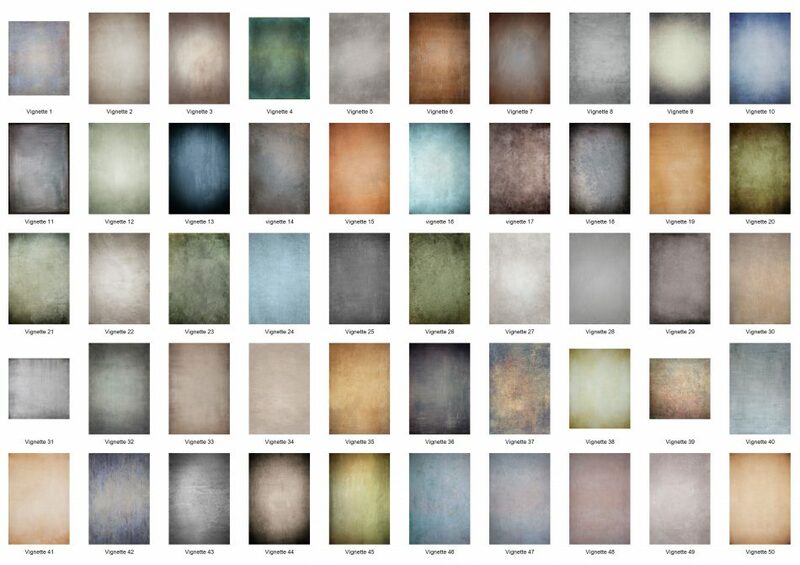 These 50 pro sized textures of various formats include portrait, landscape and square to cover all bases. The word vignette, from the same root as vine, originally referred to a decorative border in a book. Later, the word came to be used for a photographic portrait which is clear in the centre, and fades off at the edges. A similar effect occurs when photographing projected images or movies off a projection screen, resulting in a so-called “hotspot” effect. Whilst trialling these new vignette textures over several weeks we have found them easy to use when adding atmosphere and helping pull pictures together whilst bringing more attention to wherever you need it. We also include 50 generated thumbnails so that this pack will open up in Russell Brown’s Adobe paper texture panel in photoshop straight away without any problems or glitches that certain Mac based artists have noticed over the recent Mac system upgrades. This Flypaper Vignettes Pack contains 50 textures; 48 rectangles and two squares, their sizes vary with most being 4000-5000 px on their shortest side and of course they are at industry printing standard 300ppi.